Ray Kurzweil, famous author, inventor and AI futurist, predicts that “By the 2020s, most diseases will go away as nanobots become smarter than current medical technology. Normal human eating can be replaced by Nano systems. Self-driving cars begin to take over the roads, and people won’t be allowed to drive on highways.” 3 It will be interesting to see if he’s right, but I’m not sure I like that part about Nano system eating though! Is there artificial stupidity as well as artificial intelligence? But, what if the AI robots of the future, that we build, don’t obey Isaacs Asimov’s three rules of robotics when they eventually gain AGI? And, what if the machines that we create in the future get hacked-into because of threats to vulnerable security measures. No way! That couldn’t happen, right...? Much of this sounds like science fiction, but it’s something to think about as machines get smarter, more connected, and we rely more heavily on them. Is future AI going to be a MESH of GOPHers? What if we could connect those sensors, machines, computers and other intelligent devices together to take advantage of all that knowledge and computing power through a wireless network? Wireless mesh networks are expected to provide more than two-thirds of the connectivity solutions moving forward with over $5B in 2016 and with a boosted 5G cellular system expected $11 billion market by 2025 for future network AI connectivity of IoT devices.12 Are we all going to be commanding our remote devices, such as our self-driving electric cars, personal robots and intelligent mobile sensors over a Wireless Artificial Intelligent Wi-Ai network? Gopher Protocol, Inc., a publicly traded company (Symbol: GOPH), has the goal of combining their self-learning adaptive Integrated circuit microchips to 50 billion IoT devices with sophisticated mobile/global MESH communication and AI.13 Enabling IoT, with advanced communications, cloud computing and AI data analytics, will provide enhanced services, security, and other new enhanced user experiences (UE) to future businesses and homes. Who knows what else AI will bring us down the road. See you, for real, next time with another CTD. 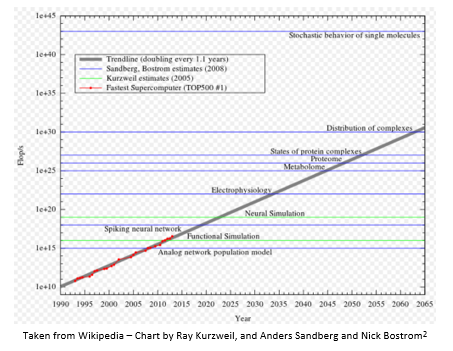 7The Singularity is Near, Kurzweil, Ray (2005), New York: Viking Press, ISBN 0-670-03384-7. 10Runaround, I, Robot, Asimov, Isaac (1950), The Isaac Asimov Collection edition, New York City: Doubleday. p. 40. ISBN 0-385-42304-7.